Hours away from an international conference in Italy’s Palermo city to kick off a new United Nations road map for Libya, the participation of rebel General Khalifa Haftar remains uncertain. 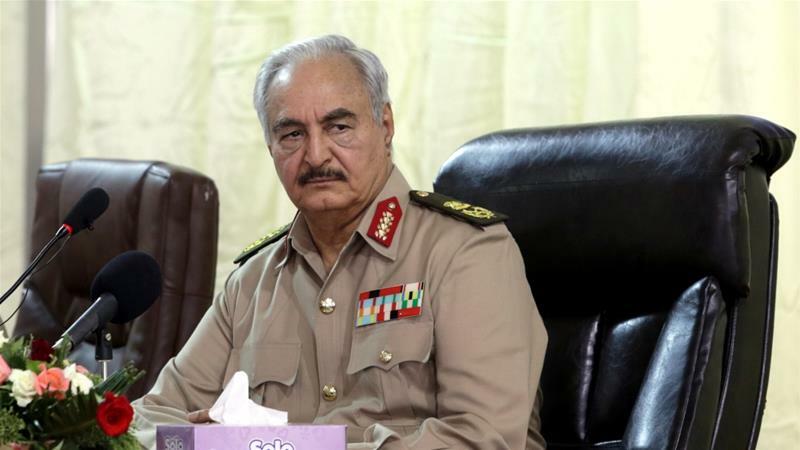 Haftar heads one of Libya’s key rebel factions in the east of the North African country, which is witnessing violence and political chaos since 2011 when its former leader Muammar Gaddafi was deposed. Official sources at the conference dismissed rumours that Italian Prime Minister Giuseppe Conte, who is hosting the conference, had flown to Benghazi to persuade Haftar to attend. Italian officials told that the participation of Egyptian President Abdel Fattah el-Sisi at the conference was “very likely” and may ensure Haftar’s attendance. Sisi is Haftar’s closest ally and his presence would be an important endorsement for the Italians, whose diplomatic efforts have been put under strain by the defection of other key international leaders, especially in the West. “I expect to see General Haftar in Palermo,” said Conte in an interview with the daily La Stampa on Monday. The Palermo conference aims to bring to the table Libya’s warring factions to support a new UN plan for a National Conference and elections early next year. The Italians have tried to broaden the spectrum of talks by inviting Libya’s armed militias and tribal leaders, efforts that Haftar reads as a direct threat to his military ambitions. According to sources in the Libyan National Army close to Haftar, the rebel general is believed to be upset about the presence of foreign delegates close to Libya’s Islamist-leaning factions and members of an “Al Qaeda-linked group”. The absence of the Benghazi strongman could deal a major blow to the first important diplomatic efforts of the newly elected Italian government. Conte’s efforts to turn the conference into a diplomatic success are already under strain due to the absence of key international leaders, including. David Satterfield, Acting Assistant Secretary for Near Eastern Affairs in the Trump administration, is likely to represent the United States. Russia’s deputy foreign minister Mikhail Bogdanov is expected to be in Palermo, while the presence of Prime Minister Dmitri Medvedev remains uncertain. German Chancellor Angela Merkel cancelled her participation, while French President Emmanuel Macron is sending his foreign minister, Jean-Yves Le Drian. The Palermo talks are overshadowed by a diplomatic wrangling between France and Italy. A French plan to hold Libyan elections in December also failed. The Palermo conference seeks to bridge the divide between secularist Haftar – who is believed to be backed by Russia, Egypt and France – and the UN-approved government of Fayez Serraj in Tripoli, who counts the Italians among his closest western supporters. Also attending are Aguila Saleh, speaker of the eastern parliament, and Khalid Al Mishri, speaker of a Tripoli-based upper chamber.